Happy Wednesday! I hope everyone is having a great week. So far mine has been very productive. On Monday I took everything out of the refrigerator, including the shelves and drawers. I washed, tossed and now have a sparkling frig. I also caught up the laundry and ironing. Whew! The ironing is what gets me behind. Yesterday I cleaned the oven and did my Tuesday chore of cleaning the living room. I am feeling much better about the state of my home. I even took some time for crafting. 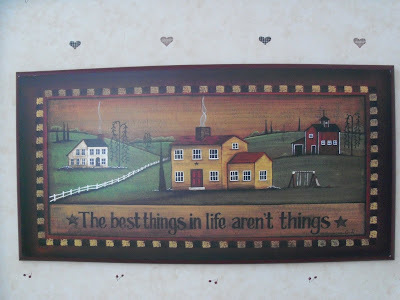 I painted a shelf for my living room and made a banner. I printed off the letters in Word. 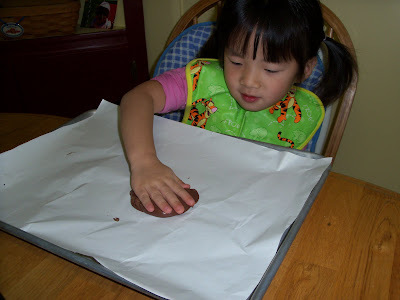 I then cut them out using craft foam. 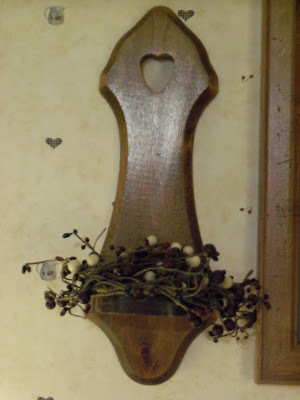 Once they were attached onto a rectangle piece of foam I then glued them to a piece of twine. Very easy and it is shows where my heart is... Spring! I plan to hang it across my kitchen window. I usually wait until the first of March to bring out the spring things. I am having a very hard time waiting this year. Once I hang it and add some other goodies I will share a picture or two with you. Today starts a new week and I am ready to go. I am in the cleaning mood. I am ready for the wonderful lemon smell of Pledge. Closets that are organized and a refrigerator that I am not scared to open. Once I have a squeaky clean space to work with I am ready to fluff! I find it fun to start moving things around when my home is clean and fresh. 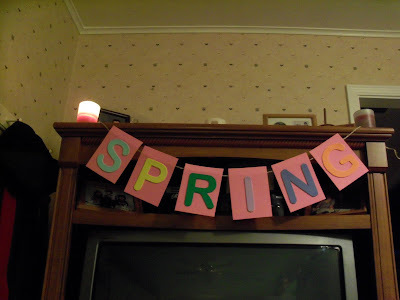 I was inspired by some things at JoAnn's and am ready to bring a little spring in. I will keep you posted on my cleaning frenzy! 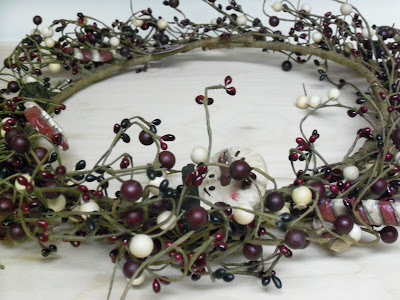 While shopping after Christmas I found a couple of pip berry wreaths on clearance for $7. The color was perfect for my living room and the price was great. Around here I haven't been able to find this color and the price for the ones I have found are close to $20 for a swag. There are these cute Christmas items attached. I have cut those off and put them back for Christmas crafting. 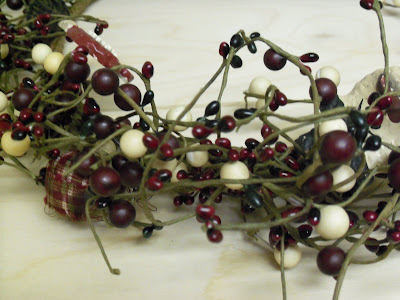 I cut the first wreath down and used almost 3/4 of it to make a couple of candle rings. I plan to glue on an updated heart and then dry brush on a brick red. Give it a little sand and then add a couple of new candles. Slowly I am getting my living room put back together. I have lots of things to makeover. I am waiting for some warmer weather so I can break out the paint and spend some time in the garage. Come on Spring! Cut steak into cubes, brown in a little olive oil with salt and pepper. Add a can of beef broth and water to cover meat. Allow to boil over medium heat; adding water as needed. I let my meat cook for 2-3 hours. Add potatoes. Cook until very tender. Add salt & pepper to taste. 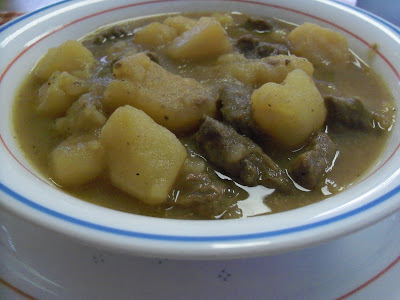 This is a yummy soup that is sure to please a meat and potato man. I usually serve this with a salad and some yummy rolls to sop up all the wonderful broth. Enjoy! Hope this finds everyone doing well. I wasn't around much last week because I was feeling a little under the weather. Just a cold, but it made me so tired. I am still dragging a little. I hope I get all of my energy back today. 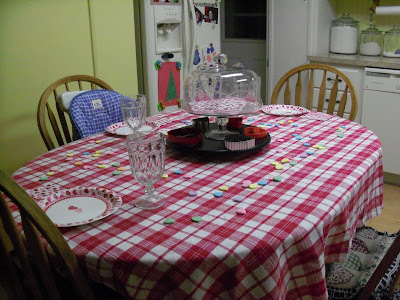 Before going to bed Saturday night I set the table for Sunday's breakfast. Megan was excited when she saw the table. She keep saying "who did this?" 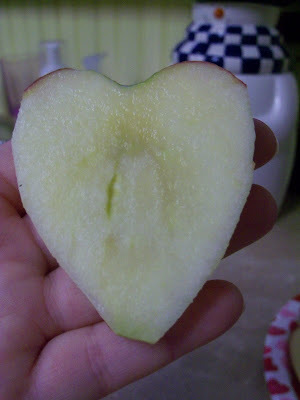 apple slices shaped like hearts. 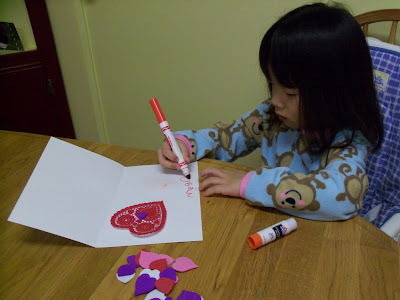 We also spent a little time last week making Daddy his valentine. Just a simple celebration to let my family know how much they mean to me. Mix dry ingredients. Add wet ingredients to dry. Mix just until wet. Add to greased muffin pan. Bake for 20-25 minutes. Mix cinnamon and sugar together. While muffins are hot dip top into butter and then into sugar mixture. Makes 10 muffins. 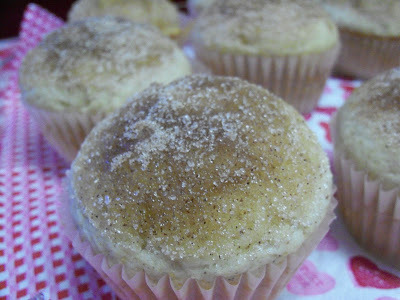 These muffins are fantastic! I saw some versions that added 1 tsp jam to middle. I only had grape jelly so I skipped that. I can see adding apple butter or a cinnamon strudel to the middle. Yummy! These are certainly a keeper. 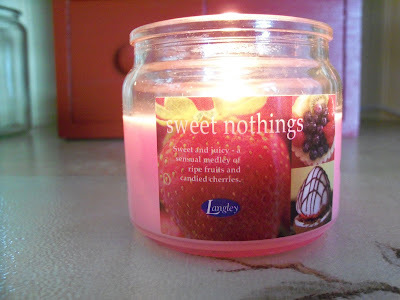 Sweet nothings is the name of my newest candle. Hubby brought it home after a recent run to Kroger. It is described as "sweet and juicy - a sensual medley of ripe fruits and candied cherries." It smells like I have a big bowl of ripe, fresh from the patch bowl of berries on my counter. Just the pick me up a girl needs on a cold, snowy day. 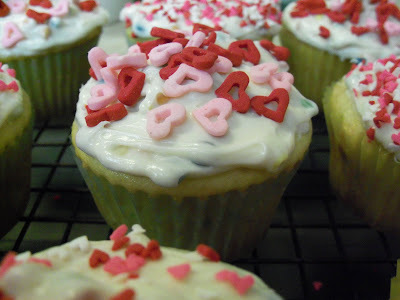 Megan and I whipped up these pretties over the weekend in anticipation of Valentine's Day. I also spent some time puttering in the living room. The wallpaper is up and I am at the point where I am putting the goodies back. This is one of my newest finds. The best sweet nothing of the weekend was this. 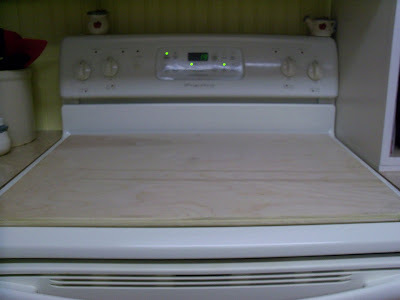 I had mentioned to Chuck that I wanted a board for the stove top. I had shown him a couple of pictures and I found this waiting for me on the stove yesterday. I was pleasantly surprised. I never know what I might find when he has time to spend in the garage. I am not sure how I am going to paint this up, but am excited to begin. I can't wait to get it finished and then add some goodies on top. We are expecting another snow storm to roll in tonight. Thankfully we didn't get hit like my east coast family. I am hearing from my northern Virgina family that they have up to 30 inches of snow. Wow! Have a fabulous Monday! When I saw the subject Monica had planned for this week I was very happy. I am the kind of gal who likes to plan and make list. Marking something off of a list gives me great pleasure! It makes me feel like I am accomplishing something. Planning has fallen to the wayside and my home certainly reflects this. I spent a little time this week planning out what I want my daily and monthly chores to look like. After planning it out I made a list in excel. I have certain days that I clean each room and this will help me not to feel so overwhelmed. Especially since I have a habit of trying to do it all at once and then getting stressed out! Each night after dinner I have been pulling out my list for the next day. 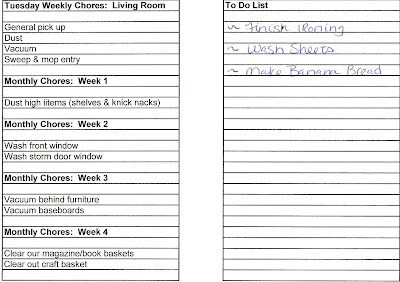 I then write anything additional I would like to accomplish that day or any appointments or errands. This is working out great! 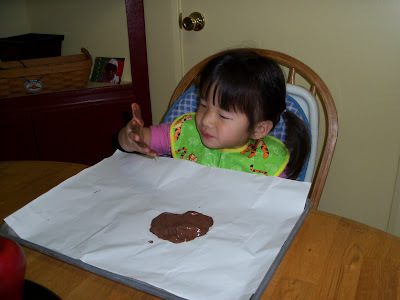 Yesterday afternoon's activity was finger painting with pudding. At first she wasn't sure. 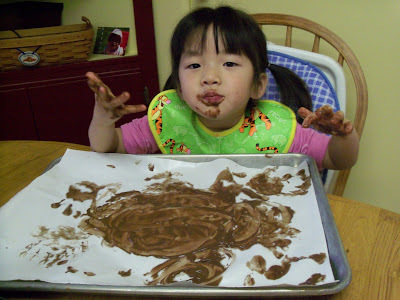 She keep calling the pudding "mud" and decided that not only was it fun, but it was tasty too! 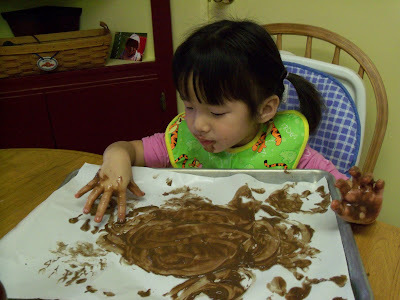 She spent a long time doing this and her imagination went wild. 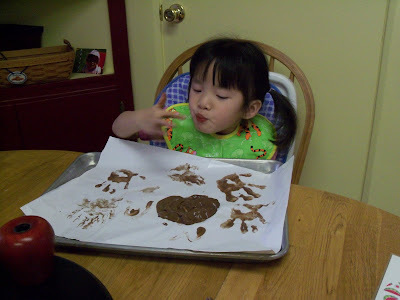 We had hand prints, houses and ABC's, the ocean and all kinds of fun things. After a little pudding time it was bath time. I wonder why?! We received the phone call that changed our life. We learned all about the baby girl we had waited so long for. 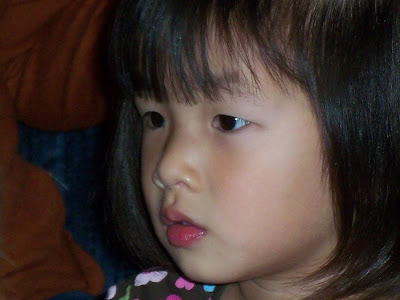 She had turned seven months on the day we received the call. She brings more joy to my life then I ever imagined. I praise God everyday that I was chosen to mother this precious little girl! We have been having experiencing some beautiful days recently. The temperatures are still below freezing and snow is on the ground, but the sun is shining. Boy is that a welcomed sight! Seeing the beautiful sunshine always makes me dream of spring. 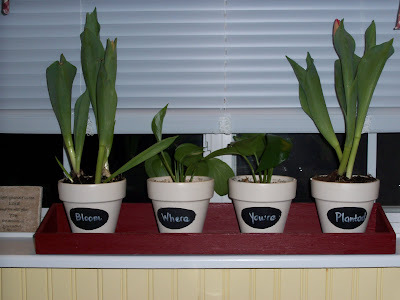 To make my dream of spring more real I planted some beloved tulips in my window sill container. A touch of spring that brings a little sunshine to my days. Wishing you all a little sunshine today!